Since the internet is ever evolving, and the web space ever changing in its format, HTML5 is now the new standard in which users will experience the content of the World Wide Web. Currently with HTML4, which is the fourth version of the hyper text markup language, video was not embedded within the code, so third parties had to create applications to play videos. This meant a percentage of risk on the end user's part as they would have to download third party software just to play back videos. Now with HTML5, video playback without third party browser plug-ins is possible, as it has video features embedded within the code. In addition to this, the drag-and-drop function for all HTML5 videos will also be independent of third party software, as it previously was dependent upon. 1. Your HTML5 document must start off with a <!DOCTYPE> as this tells the web browser what version of HTML the document is in. 2. Follow this up with an HTML element which will demonstrate the language of the document. Inside this <html> element you will have a <head> and <body> element which contains information about the HTML document, where the body has the main content of your document. 3. Finally close it off with </html>. Note that in this example, the head, body, and title also have closing elements added in. If these are not added in, then the HTML language of the document won't be complete and it will not work as intended. This is a very simple HTML document that does not have audio, images or video added into it. So how do you use tags to incorporate audio and video into your web page? 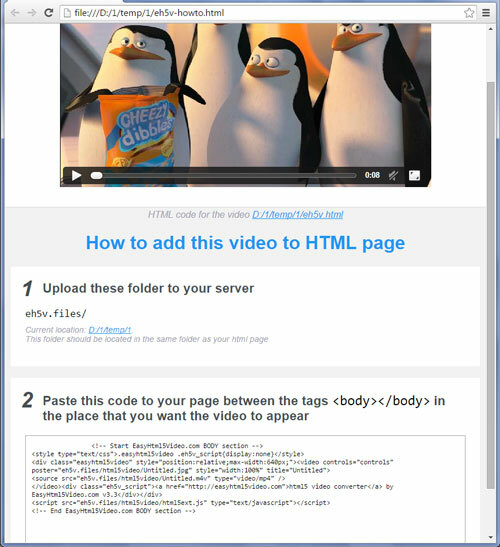 In order to add a video to your web page that is written using HTML5, you must use the correct elements and tags. Both video and audio elements must have a start and end tag incorporated into the language, as well as a source element for your audio and video (the source in which these elements come from – usually a URL). Video element not supported by your browser. This coding shows us that the language of the HTML document is English, that the title is Example Document, and that the home video is coming from two source elements. It also shows us what will show up if the browser does not support the video element. By using these tags, you can incorporate videos, images, audio and templates onto your web page so that it can host your content efficiently. If you are looking for an easy place to start with HTML, please check out EasyHTML5Video at: http://easyhtml5video.com.